College hockey season begin in early October and, if a team manages to reach the Frozen Four, doesn’t conclude until mid-April. When the games are over, the “other season” begins, when the emphasis shifts to the training room where the goals are to build strength, speed and endurance. 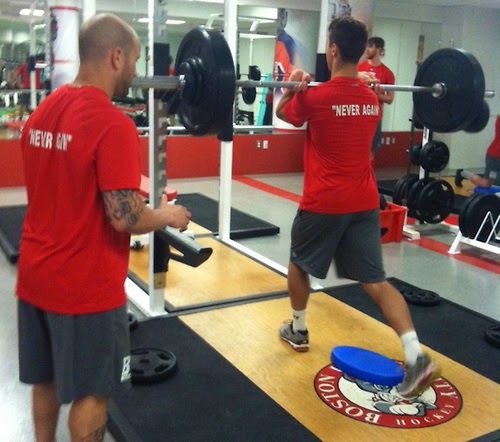 At BU, those efforts are directed by strength and conditioning coach Anthony Morando, a disciple of legendary BU strength and conditioning coach and innovator Mike Boyle. 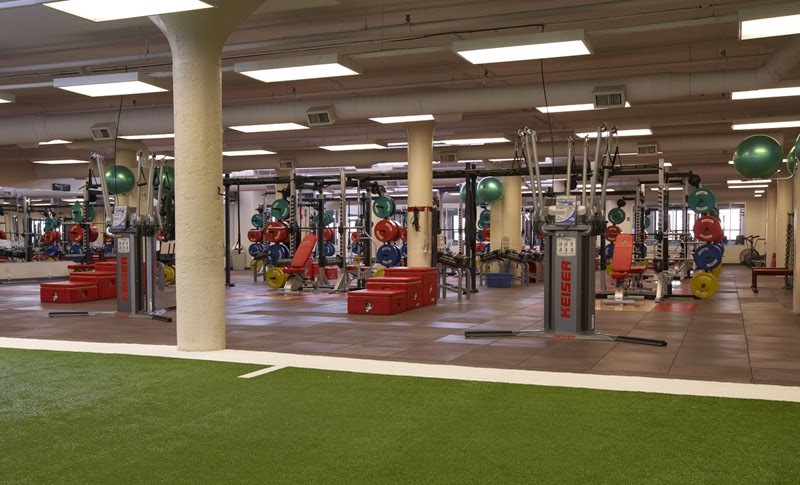 And they’re conducted in BU’s 12,000 square-foot, state-of-the-art strength and conditioning facility, built with contributions from numerous ex-Terriers including Jay Pandolfo, Chris Drury, Keith Tkachuk, Rick DiPietro, Ryan Whitney and Tom Poti. Last week, Morando’s “other season” regimen for the Terriers was the subject of a USCHO feature article, in which Morando explains that “Our goal is to get down to an individual level and make sure nobody ever outworks us.” He also discusses his recent opportunity to work with his counterparts from the San Jose Sharks. Q. Is there a single area that most freshmen need to address when they arrive at BU? A. The one area as a whole that the freshmen need to know is that their role on this team is just as important as a senior’s role is. We all work together to accomplish one goal, and that is a championship. Every freshman immediately knows when they arrive that in order to accomplish the ultimate goal (championship), they need to excel not only in hockey, but in school, the dining hall, the weight room, and outside of school. Everything has a purpose. They eat with a purpose, study with a purpose, train with a purpose, and play with a purpose. Q. Over the years we've seen some skilled players make significant improvements in skating speed that helped them become standouts. Mike Grier, Jay Pandolfo and Nick Bonino, to name a few. How do you help them improve that part of their game (assuming you don’t use the catch-the-chicken method from Rocky 2)? A. Well, unfortunately in the city of Boston you won’t find too many live chickens running around. Mickey said in Rocky 2, “Rock you need greasy lightning fast speed.” We don’t chase the chickens. The boys squat, they deadlift, pull sleds, push sleds, and then they sprint. The whole purpose of incorporating resistance training is to create more force production. The more forceful an athlete can be, the more speed he is capable of having. There any several opinions and exercises out there that are always compared on which is better, what idea is better etc. If speed is the goal for an athlete, then they need to lift hard with fundamental approaches and excellent technique, as the same for their conditioning program. We sprint on the field, we run on the treadmills, we sprint up hills, and we sprint short distances. Hockey is a fast game. It possess several different types of movements, and places demands upon several energy systems within the human body; we train it all! Q. Adding bulk is another issue some players face. What are some of the techniques for helping them achieve that? A. It is certain that some players need to gain weight. The term “bulk” can be taken in more than one context. This kid needs to “bulk up” is usually how it is said. The word bulk, to me as a strength and conditioning coach, means “he needs to put weight on.” Gaining weight requires three things: lifting, eating, and more eating. Not only does the athlete need to train, but nutrition will be 90% of what he does. If the athlete needs to gain weight the correct way, he will have to work just as hard as an athlete who needs to lose weight. Quality foods, quality carbohydrates, fats, and proteins all have to be consumed. So, when we need to add “bulk,” our goal is to add muscle, not fat. A small amount of body fat will be added; sure, it always does when it comes to gaining weight. We want to make sure the athlete has a quality weight gain, which will not compromise speed or skill. Q. In Scott Weighart’s book, Burn the Boats , he described how the Terriers regularly went for a 5-Mile run along the Charles. Is that something still done or would you like to implement it? A. To answer the question I will first begin by saying that “I am all about tradition, and when I was a kid, BU not only won consistently, but they hammered teams for all three periods of a game”. In order to bring this back, and in order to have a team that outworks everyone, and anyone they need to be healthy. The 5-mile river run does not fit into our program for a few reasons. We do run, but not for that duration. The longest we will run will be for a 3-mile run around campus and a portion of the river. Long distance running for a lot of these athletes on the men’s ice hockey team will compromise their ability to perform on the ice. Some athletes can’t handle the friction of ground impact. Some have shin splints that reoccur. Some have a past knee issue, or a hip issue. Some have low back pain and if they run a long distance, they become symptomatic. The team is healthy; but they are healthy because their programs are individualized, and there is great attention to detail. I always seek a purpose that will benefit within the translation to the ice. Team building is something we do--in and out of the weight room. I incorporate team-building in several other different ways, and incorporate specific long bouts of conditioning that will not compromise their joints, and will sustain their positive affect on the ice. In order to win, we need all hands on deck and we need to be healthy. 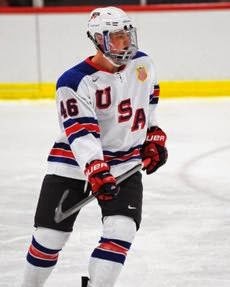 Eichel skated for Team USA in the 2014 World Junior Championships as an under-ager, scoring a goal and four assists. ● Eichel video highlights from 2014 WJCs. ESPN’s Corey Pronman reviewed the evaluation camp performances of Eichel and uncommitted U18 forward Auston Matthews in an Insider Report. Former Terrier captain, NHL player and Bruins head coach Mike Sullivan is serving on the coaching staff at the camp in Lake Placid. Most recently an assistant in Vancouver, Sullivan talked with NHL.com about the opportunity to work with many of the top young American U-20 players, including Eichel, who is from the same hometown, Chelmsford, Mass., as Sullivan. 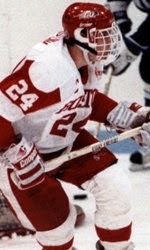 In four varsity seasons, the left-shot center score 138 points (61G, 77A) and captained the 1989-90 squad that reached the NCAA Final Four in a dramatic post-season run. He went on to tally 136 points in an 11-year NHL career. ● Video: Sullivan scores shorthanded to tie Northeastern with 3 minutes remaining in regulation in the Beanpot semifinal. BU would win in overtime. ● Video: Sullivan and Tony Amonte score third-period goals to lead BU past Michigan State in the NCAA quarterfinals. Former Terrier captain and U.S. Olympian Kevin Shattenkirk discussed his disappointment at the Blues' playoff exit and his optimism that team chemistry and added talent will have St. Louis back in the hunt for the Stanley Cup. 2015 recruit Maxim Letunov chats with Youngstown coach Anthony Noreen at the Phantoms summer golf outing. The 6-2, left-shot center from Moscow was selected in the second round--#52 overall—by St. Louis in the 2014 NHL Entry Draft. Letunov, who rang up 43 points in his first USHL season, will be joined on the Phantoms next season by 2016 recruit Vas Kolias.